Raymond Soneira, the display guru from DisplayMate visited SID and inspected the OLED TV panels on show from both Samsung and LG. He really liked LG's prototype - and says it was "absolutely stunning, visually it was the most impressive TV I have ever seen". The one thing he didn't like is the glossy screen. Regarding Samsung's OLED TV, he was less impressed. It was very nice, but "definitely not in the stunning category like the LG 3D OLED TV". He said the demo was mediocre and the 2D images were actually "horrendous because its color saturation was turned up so high that it was beyond gaudy and into visually repulsive territory". Hopefully users will be able to calibrate their color preferences - for guys like Raymond who prefers accuracy over saturation. In my opinion both displays were magnificent, I wasn't really able to tell which one I liked more. Hopefully once both TVs are shipping, it'll be possible to run side-by-side shootouts and see what's the better TV and technology. 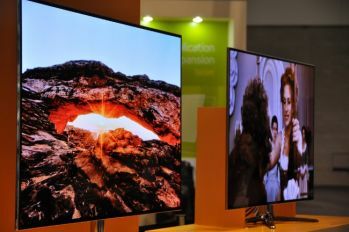 Click here for more info on Samsung's OLED TVs at SID, andhere for LG's SID OLEDs.